Synopsis: For millennia we've caught only glimpses of the lives and loves of the gods and goddesses on Olympus. Now Aimée Carter pulls back the curtain on how they became the powerful, petty, loving and dangerous immortals that Kate Winters knows. Review: I'm going to keep this review short and sweet because that is what these stories were. I loved them and Aimée Carter is one of my favorite authors. 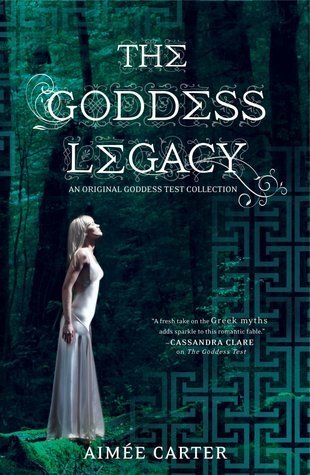 This was the perfect book to tide me over until The Goddess Inheritance comes out.My favorites had to be Henry/Hades's story and James/Hermes's story. I mean come on, who doesn't enjoy reading about an adorably troublemaker and a quiet, dark hero? The only downside that I had with these stories was that Ava/Aphrodite, Calliope/Hera and Persephone seemed really whiny to me. I get that Ava and Persephone going to sound a little bit like that, but I didn't expect that from Calliope. I couldn't feel any sympathy for Calliope, because it seems like everything bad that has happened to her was kind of her fault. Ava's lack of commitment kind of got to me, but I understand the whole Goddess of Love Can't Commit thing. Persephone...she just annoyed me. She was just...ugh... and her relationship with Adonis didn't seem all that healthy or good for anyone. Okay back to the good. The best thing about this book had to be the last part with Henry/Hades seeing Kate. I thought that it was so cute and I really enjoyed that part. I am also very, very sad that Tuck didn't make it. I think James/Hermes needed her and It was amazing what Henry/Hades did for him in the end. Tuck was my favorite of the new characters. I recommend this SERIES to everyone that I know. I have loved Aimée Carter's series since the first one came out and I cannot wait until the next one comes out.